GIFFARD DE MONCEL, ROBERT, master surgeon, colonizing seigneur, member of the Communauté des Habitants, first doctor of the Hôtel-Dieu of Quebec and doctor in ordinary to the king; b. c. 1589, the son of Guillaume Giffard and Louise Viron, in the parish of Autheuil (Orne, France); d. 14 April 1668 at Beauport and was buried there two days later. 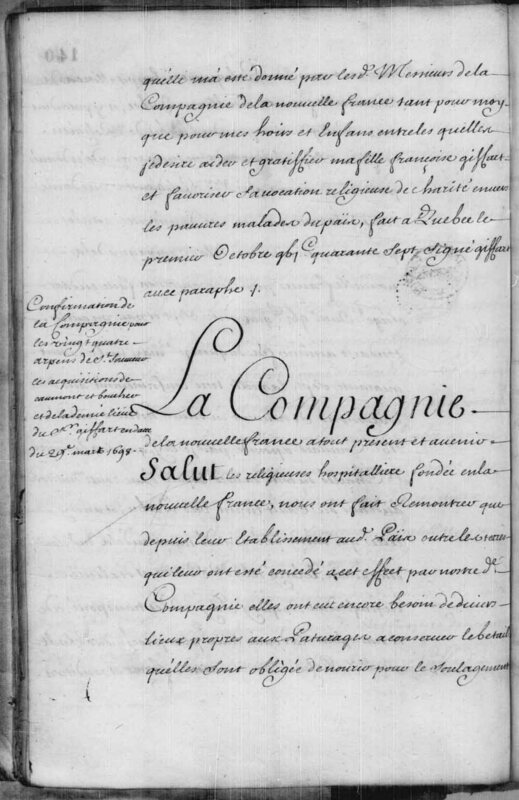 His marriage contract with Marie Regnouard was drawn up on 12 Feb. 1628 at Mortagne. Established at Beauport, less than two leagues from Quebec, Giffard was the first colonizing seigneur in New France. This vocation was superimposed upon that of “naval surgeon,” a title that he bore in 1627, when mention of his coming to Canada was first made. He became the first doctor of the Hôtel-Dieu of Quebec in 1640, apothecary, and even “doctor in ordinary” to the king in 1647, a purely honorary title which crowned his career and his prestige. Robert Giffard was therefore launching what was solely a colonizing enterprise, and as early as 1634 he concluded at Mortagne a hiring agreement with Jean Guyon Du Buisson senior and Zacharie Cloutier to take them forthwith to Canada, each being accompanied by one of his children, to begin the operations of land-clearing and settling. This was the starting-point of what has been called the immigration from the Perche, which was continued by Noël Langlois, Jean Juchereau de Maur, Gaspard and Marin Boucher, and others, all of whom were the forefathers of important families in the French-Canadian nation. 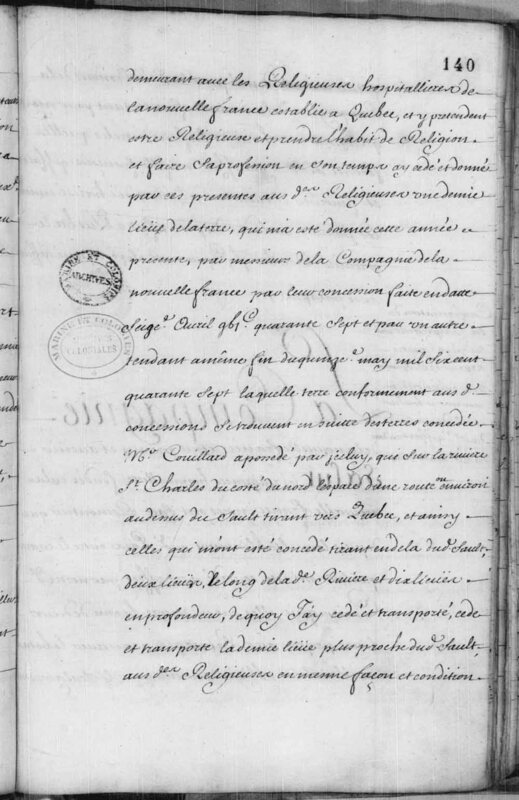 In Giffard’s house was drawn up, on 27 July 1636, the oldest marriage contract preserved in any Canadian archives (ASQ), that of Robert Drouin and Anne Cloutier, the daughter of Zacharie. The seigneury of Beauport was enlarged on 31 March 1653 and extended to a depth of four leagues. At the time of the 1666 census it comprised at least 29 households and 184 persons. 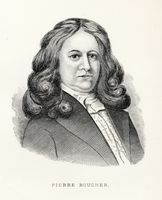 Robert Giffard rendered a number of services to the colony. In 1637, near Trois-Rivières, he risked his life to repel the Iroquois. In 1645 he was a churchwarden in the parish of Quebec. On 6 March of the same year was founded the Communauté des Habitants, a society for trade with the Indians, all the members of which could also carry on trade on their own. Giffard immediately became a member and subsequently signed all of its official documents. He also had a small ship for the trade. Because of the abuses of Pierre Legardeur de Repentigny and the other directors of the Communauté des Habitants, who were related to each other, Giffard with Chomedey de Maisonneuve undertook a trip to France during the winter of 1646–47. 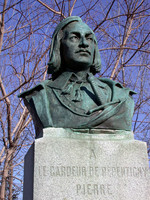 In 1648 he was named to the council of Quebec, which had been established by order of the king in 1647. In return for his services Giffard first received two other seigneuries: that of Saint-Gabriel, to the northwest of Quebec, on 11 April 1647, and that of Mille-Vaches, below Tadoussac, on 15 Nov. 1653. He did not, however, take possession of these lands; he gave a quarter of the seigneury of Saint-Gabriel to the Nuns Hospitallers of Quebec (later the fief of Saint-Ignace) as a dowry for his daughter, Marie-Françoise Giffard, dite Marie de Saint-Ignace, who became the first Canadian nun. The rest he gave to the Jesuits as an extension to their seigneury of Sillery. 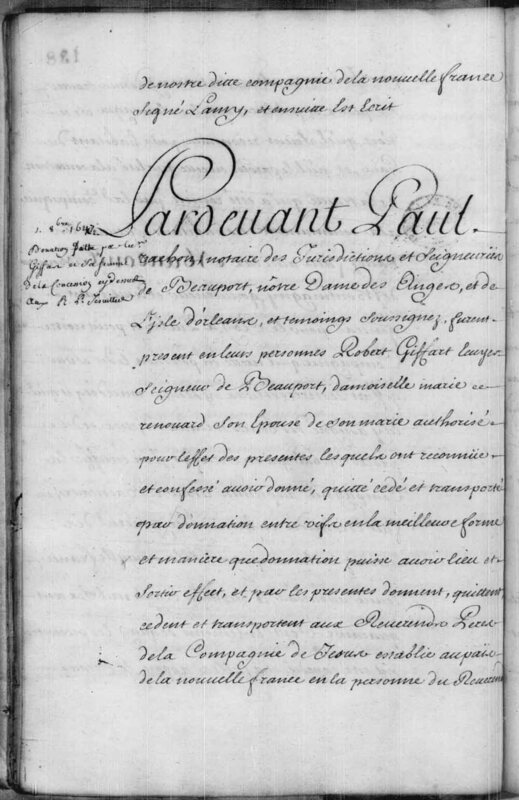 With the support of Governor Voyer* d’Argenson, Giffard obtained for himself and his lineal descendants one of the first letters of nobility granted to a resident of Canada, signed by Louis XIV in March 1658 and registered by the Conseil de Québec on 8 September. Robert Giffard died on 14 April 1668 in his manor-house at Beauport. 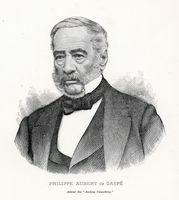 An excellent Christian, a friend and benefactor of the Jesuits, he was favoured with the attendance of Father Étienne de Carheil* throughout his illness. His funeral took place in the presence of Bishop Laval* and the clergy. 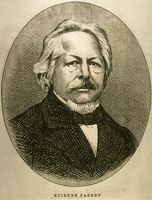 The Giffard name died out in Canada with his son Joseph, who left no issue. Besides his daughter who was a nun and another son who returned to France after only a short stay, Giffard had three other daughters: Marie, the wife of Jean Juchereau de La Ferté; Louise, married to Charles de Lauson de Charny, and Marie-Thérèse, the wife of Nicolas Juchereau de Saint-Denis. At Giffard, a municipality situated between Quebec and Beauport, a monument commemorates Robert Giffard. 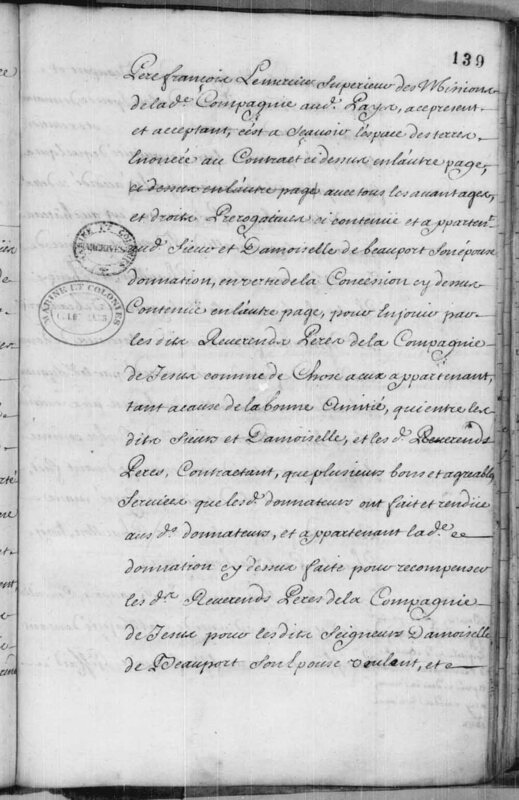 ASQ, Documents Faribault, 2, Accord de mariage entre Robert Drouin et Anne Cloutier, chez Giffard de Mortagne, 27 juillet 1636. JR (Thwaites), passim. Juchereau, Annales (Jamet), passim. P.-G. Roy, Inv. concessions, passim. Bibliothèque et Arch. Nationales du Québec, Centre d’arch. de Québec, CE301-S1, 16 avril 1668. Honorius Provost, “GIFFARD DE MONCEL, ROBERT,” in Dictionary of Canadian Biography, vol. 1, University of Toronto/Université Laval, 2003–, accessed April 19, 2019, http://www.biographi.ca/en/bio/giffard_de_moncel_robert_1E.html.